o-owners Adriana Cortes and her father, main chef Vidal Cortes, will be adding some Mexican flavor to their menu at their family-owned restaurant and catering company, Delicious Southern Cuisine at the 10th annual Taste of Soul. This year, the father and daughter duo will increase the number of Taste of Soul vendor booths, allowing for more food options. One booth will focus on the original recipes the South L.A. community knows and loves like mac and cheese, greens, yams, po’boys, fried chicken, and catfish. The second booth will include a variety of Mexican infused southern dishes like chicken fajitas, beans and rice and more. The community surrounding the Dunbar Hotel has changed quite a bit, with an increase in the number of Latinos living in the area. “We are Latino and we do know how to cook Mexican food. That’s why we are doing this fusion between southern food and Mexican food,” Adrianna Cortes said. The menu at the current location allows customers to order the restaurants special items which include spaghetti, gumbo jambalaya, and her mother’s famous peach cobbler. The new location will continue to serve southern food but this time with a twist. For example, the father daughter duo are offering nachos with beef brisket. 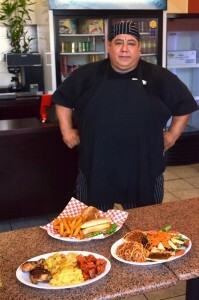 Vidal Cortes has been whipping up soul food in the kitchen for 26 years, with humble beginnings as a dishwasher at Boulevard Café. A sudden spark of interest overcame Vidal and the chefs soon taught him everything they knew about the ethnic cuisine. “He worked at our current location before until it closed down. He decided we just open it back up again, I know how the kitchen runs, everything is already set up, and we know what we need to invest in,” Adriana said. For more information on catering upcoming weddings, birthday parties or corporate events call the restaurant at (323) 298-0445 or visit www.DeliciousSouthernCuisine.com.